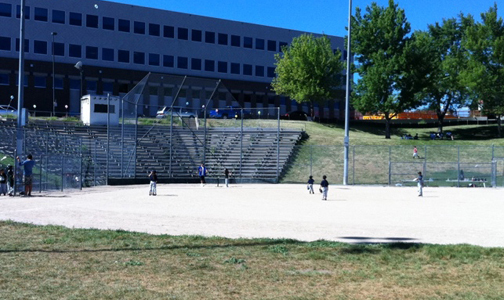 Last Saturday, August 6th, was an end of summer BBQ and T-Ball Tournament for the residents of Sun Valley at Rude Park. The event was sponsored by the Riverfront Park Community Foundation with a donation of $2,000 and another $1,000 in personal funds donated by Mark Smith, the president of the Foundation. The Riverfront Park Community Foundation each year determines where the money raised by the transfer of properties within Riverfront Park is donated. This year, the Sun Valley Experience was awarded some of the money. The program helped enroll approximately 180 needy kids in summer sports programs like t-ball and swimming. Sun Valley is a Denver West neighborhood that is located between 1-25, Federal, 6th Ave and 20th Ave. Fresh Start, an organization whose mission is focused on family and community centered activities for Denver residents, sponsored the event. The BBQ was a huge success with a couple hundred people attending. The Colorado Rockies even donated 500 tickets for the families to enjoy a game! Click here for a video about the event and to learn more about Fresh Start.